When I was a kid, I secretly enjoyed having maple syrup flow onto my bacon or sausage. While most people would save their sausages from drowning by moving them to higher ground, I left them in the lowlands, gleefully watching as the creeping syrup engulfed things it wasn’t supposed to. Sometimes, if I was feeling bold, I’d even let my hand “slip” so that the stream of golden brown maple syrup would actually pass over the meat products. It’s a secret I’ve kept for a long time, sharing only with a few trusted friends, but today I’m coming out of the closet. If you’ve ever had similar tendencies, this post is for you. If your face is contorting in disgust, come back some other time because this post is about bacon (yes BACON) pecan pie. Still there? Okay, you’re probably wondering how on earth I came up with such a magnificent unusual combination. While I’d love to take all the credit, to tell you the truth, the idea was inspired by Tartelette. More specifically by a photo she took for her Hazelnut Tartelettes back in January. It’s the second one down the page to the right. Perhaps I’d had a little too much to drink that night, but that long ripply smear of chocolate looked like bacon to me. I actually had one of those cartoon moments where I shook my head, rubbed my eyes and looked at it again before the mirage faded and I realized what it actually was. For that brief instant, all those childhood memories of letting my bacon drown came rushing back like a tide of sweet sticky syrup. 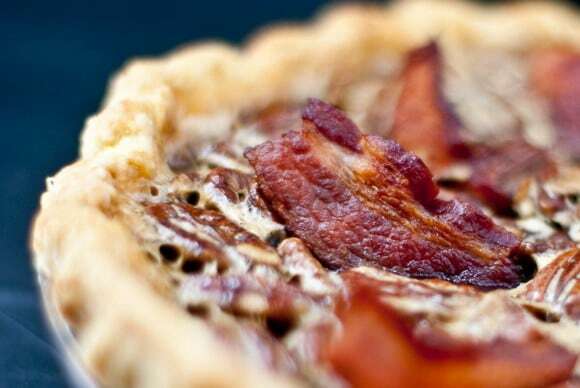 It didn’t take long before the idea of bacon pecan pie was born. I’ve honestly never been a big fan of pecan pie. Most of the time it’s an over sweetened cloying mess that’s either too goopy or tough and chewy. But it’s one of those things I’ve always liked in theory, so over the years, I’ve had a handful that were actually pretty good. Still, even the best ones tasted one dimensionally sweet and I’ve always wondered what sprinkling a little fleur de sel on top might do. Honestly I’m a little disappointed in myself for not figuring out this combo sooner given my childhood breakfast proclivities. Now that the idea was set in motion, I just had to figure out how I would go about creating the pie. Would the bacon get crumbled up in the filling? Should I replace some of the butter with bacon fat? Since I’ve never made pecan pie before I took the base recipe from Cooks Illustrated. Then, I took a page from my own bookand infused the crust with bacon flavour using both the lard and pulverized bacon. I didn’t want to change the texture of the filling and I wanted crisp strips of bacon, so I chose to garnish each slice with a strip of bacon after the pie was done. Not content with just adding bacon, I also added booze to the mix, because booze (like bacon) makes everything better. Because the mixture is never boiled, you definitely taste the alcohol but if that’s not your thing, you can always boil the bourbon in the microwave for a few seconds to burn off the alcohol. Move the oven rack to the middle position then preheat to 350 degrees F. Spread the pecans on a baking sheet then roast in the oven for around 10 minutes or until they are fragrant. Fry the bacon over medium low heat until brown and very crisp then transfer to a paper towel lined plate to cool. Measure 2 Tbs of bacon lard into a glass or metal container then allow it to come to room temperature before placing it in the freezer. Put 9 pieces of the fried bacon (3 whole strips) in the freezer as well. Put the frozen bacon into the work bowl of a food processor and blitz until the bacon is powderized. Add the flour and sugar, processing until it's well incorporated into the flour. Add the frozen bacon grease, and butter then pulse until there are pebble sized pieces of fat. Whisk together 1 egg with 1 tablespoon of ice water. Add 2 tablespoons of this mixture too the food processor and then pulse to combine. 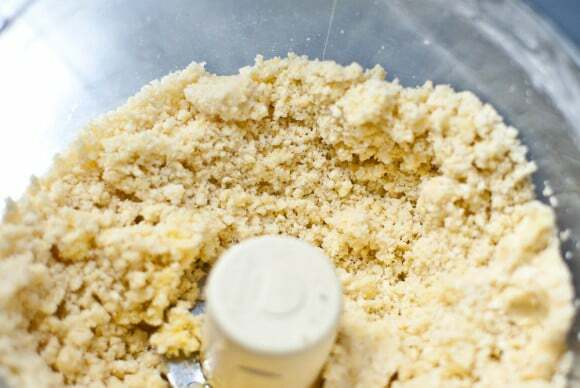 Continue to add more of the egg mixture and pulse until the dough is crumbly but just starting to come together (pictured above). You shouldn't need to use all of the egg mixture. Turn the pebbles of dough out onto a sheet of plastic wrap and press together. Using as few motions as possible, flatten the dough with the palm of your hand then use the plastic wrap to fold the dough over itself. The idea is to flatten the beads of cold butter into layers, which will make the dough flakey. Too much handling though and you will form gluten in the flour which will make the dough tough. Flatten once more, fold over and shape into a puck. Wrap with the plastic and put it in the refrigerator for at least 1 hour. On a floured surface, roll out the dough so it's bigger than a standard pie plate. Roll it onto your pin and slide it over your pie plate. Unroll it making sure it's centered. Gently press the dough into the corners of the plate and then use kitchen sheers to trim the dough with 1/2" of overhang. Tuck the overhang under itself then flute the edge with your fingers. Return to the fridge until hard. Preheat the oven to 400 degrees F and cover the crust with aluminum foil, pressing the foil against the dough. Use a fork to poke holes through the foil and through the dough. Dump some dried beans or pie weights onto the foil and put the crust into a preheated oven. Bake for 15 minutes or until the crust is set. 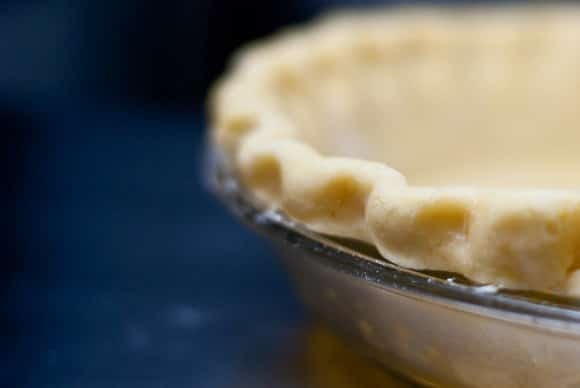 Remove the foil with the pie weights and return the crust to the oven until it just starts turning brown 7-10 minutes. Turn the oven down to 275 degrees. 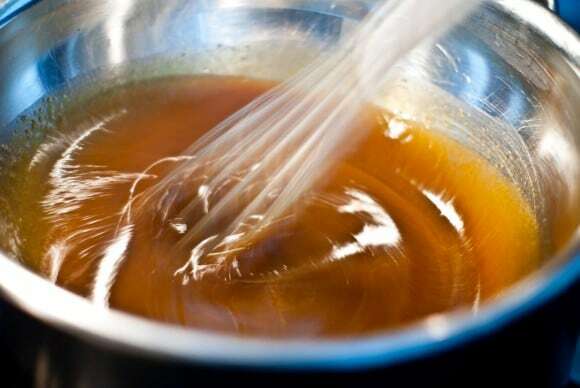 Setup a double boiler with a metal bowl over a pot filled with water and bring the water to a gentle simmer. Melt the butter, then add the sugar, corn syrup, and salt. Once they're dissolved, whisk in the eggs one at a time until combined. Switch to a heatproof spatula and mix in the vanilla and bourbon. Continue stirring, scraping the bottom and sides of the bowl until the mixture reaches 130 degrees F.
Remove it from the heat, add the pecans and pour the mixture into the warm crust. Bake for 50-60 minutes or until the center is mostly set. Insert the remaining 9 pieces of bacon into the top of the pie while it is still warm. Let it cool completely before cutting. I'm entering this in the Foodbuzz BACONALIA challenge as an entry. This pie sounds amazing! 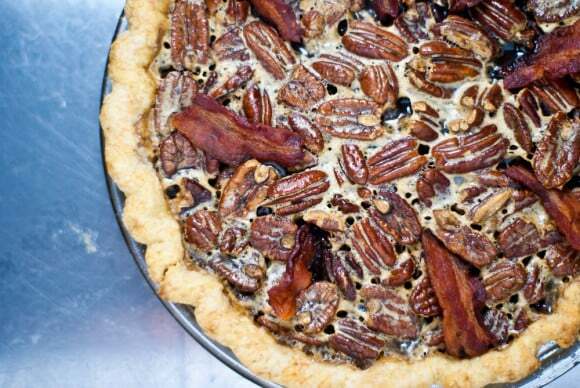 I’ll bet the salty bacon complements the almost-too-sweet pecan pie perfectly. Yum! Another inspiration along the same lines- the bacon buttermilk pralines from Screen Doors and Sweet Tea- an appetizer/snack that’s definitely on my to-make list! as a lover of pecan pie, particularly, chocolate pecan pie, i am skeptical. this won’t stop me from letting you make it for me though. I sheepishly admit that I am not a big fan of pecan pie. Toooo sweet. But hmmm, with bacon? That would definitely tame the sugar. Maybe I should make this the centerpiece of Thanksgiving this year! I do love pecan bourbon pie – what a neat idea to make it with bacon! great yummy pie, I never had pie with bacon in it. Oh sorry, I think I just fainted. You’re my hero! This looks a-ma-zing! Sounds Great. Kind of like mincemeat but with better meat. lol, this is everything I hoped it would be. I need to try this. Good to see you broke free out of that closet Marc!…LOL I secretly enjoy maple syrup on bacon (as do others) and I would def give this pie a try just to see what it would taste like. I never liked pecan pie because there was no relief from the icky sweetness. The bacon is a great (and fun) (and creative) idea. You should get out there and market this! Seriously. You’re not the only one with that breakfast habit! My friends and family always thought I was so weird for putting syrup on breakfast meats. It’s the ultimate combination of sweet and savory in my opinion. holy crap, this may be the coolest thing i’ve seen in a long time. bacon is one of the BEST things w/ sweet stuff ever. i saw a recipe for bacon brownies and thought, “GENIUS!” so i can see this working really well. i still think you were smoking something when you came up w/ it though…. Wow that looks delish! Great combo! For real? Wow! You know, being from the south, bacon and pecans, how could I not love this? I think Pecan Pie is wonderful, but only in very small doses. But you’re right, adding something salty, like bacon, might be the answer to making it the perfect dessert. Heck, I’m willing to give it a try just for the shock value alone, though I have a sneaking suspicion someone is bound to think it’s fantastic! Love the combination of sweet and salty bacon! This pie looks scrumptious!! Bacon and Bourbon Pecan Pie? It must be served in heaven. What an amazing combo! I have got to try this. I never realized that syruping the bacon was unusual. My only adulthood syrup revelation was that most people prefer maple syrup to pancake syrup, which I will never understand or agree with. I like it down south karo syrup style, and bacon and booze DEFINITELY makes everything better. Especially in this pie. Nice work. This looks very special with the addition (as crazy as it may be!) of bacon! And bagna cauda with bacon? What’s gotten into you lately? I’m loving what I’m seeing in these pictures! The first thing I do, very openly btw, when my breakfast order hits the table is to drench the sausage AND bacon in maple syrup. I’m shameless, I know. I will save this recipe for the holidays when I usually make pecan pie for a multitude of meatlovers. Bravo again!